You can easily put an under construction message on your blog’s homepage by activating a Under Construction WordPress theme. When it comes to choosing a WordPress theme, we have the option it choose it from freely available themes and premium themes. Nowadays you can easily find premium like free WordPress themes when you search it on Google. Free WordPress themes are of equal quality as of premium themes. The only major difference is you don’t get proper support with free themes. 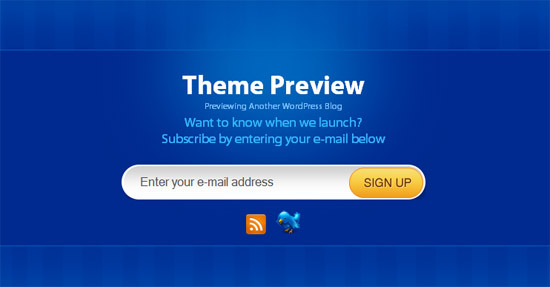 So in most of the cases you can just download and activate a free theme on your blog. 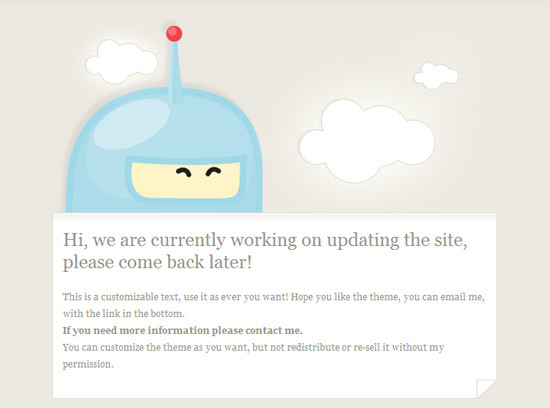 Here are some beautifully designed free WordPress themes for under construction WordPress blogs. Anyway, thanks for sharing, these are 5 handy themes! .-= Yann´s last blog ..20 ways to use wordpress other than for blogging =-. I liked the TempSkin theme. 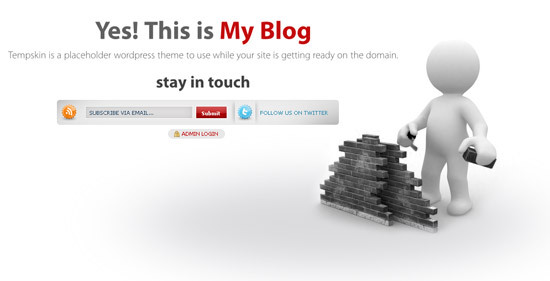 .-= Ruchi´s last blog ..How to use Digg Effectively to Promote Your Blog =-. Changing Room looks cool. I wish I had know about this 8 months ago when my blog was still under construction. I would have taken a snapshot of it for posterity. Tempskin also looks really neat. .-= James M.´s last blog ..Bugs Bunny Poster =-. TempSkin is simple and looking good. Also the changing room. .-= Pavan Somu´s last blog ..Realpress Multi Coloured WordPress Themes =-. I like the ” TempSkin “. .-= Anish K.S´s last blog ..Twitter said to be profitable after making $25 mn search deals =-. I have never ever used such themes before, but might in the future if I start a new site. BTW, I have added this post to next weeks Monday roundup. I’m sure my readers would benefit from this. .-= George Serradinho´s last blog ..eBook â€“ Delicious Candy Recipes =-. .-= steppinout´s last blog ..December â€“ To Do List =-. .-= Gennice´s last blog ..3 Ways To Delete All Pending Comments With One Click In WordPress =-. 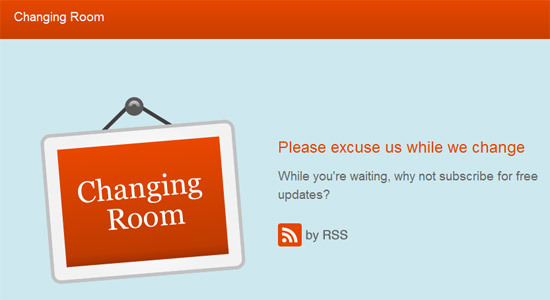 .-= Loveish´s last blog ..Firefox is all set to launch its Mobile Version =-. It’s great you done a nice job Right on time ! these design are really attractive and may useful to blog user…appreciated nice post keep it on, thanks. .-= Rajesh Kanuri @ TechCats´s last blog ..How To Add New Year Countdown Widgets In Social Networks =-. I am using a plugin by css jockey. You can have a look at my blog. Btw nice collection simran. Wooh this good tactic. Readers can easily know that the blog is under construction. this is awesome, thanks google.. I have found this post.